Then one day you notice…it’s beginning to lean to one side slightly and a small crack is appearing in the main fork. How can this happen. This old family member is starting to falter. What can we do to help it stay healthy and strong. We could feritlize it and make sure its watered properly. We could call an arborist to check it out and treat it with the latest technological stimulants. We could trim it to remove the unhealthy parts and baby it back to health. Or, we could tie it to something to keep it from falling over and hope it heals itself. The home owner at one of our recent home inspections chose the last option. ”There are some old wires running right through our favorite old tree. Lets tie our friend to those wires to hold it up when it feels weak, and in a few years it will be good as new”. Yeah, probelm solved! Seriously, this is an extreme safety hazard. Electrical service wires should never touch anything from the service pole to the mast head on the house they are serving. 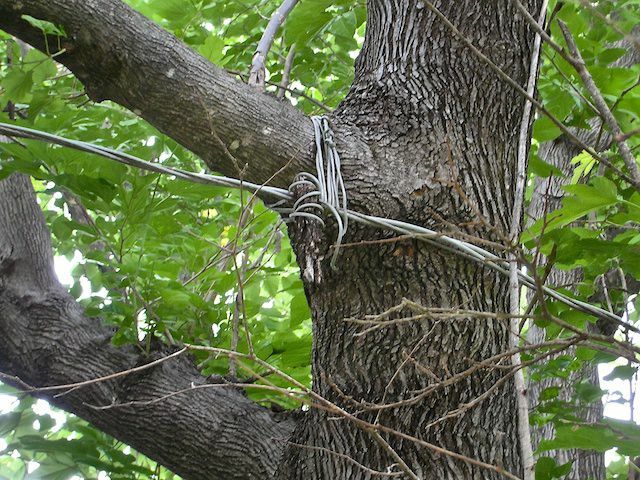 We commonly see service wires running through tree branches and brush and we always recommend trimming the foilage clear of the service wires. Electricity is always seeking the easiest and quickest way to the ground. This tree and anyone touching it could provide that path. Especially if the tree is wet. I would hate to touch this tree on a rainy day. This condition was reported to our clients on our inspection report and the home owner was notified of the safety hazard.